WELCOME TO THIS LOVELY VILLA IN TANGLEWYLDE SECTION OF OAKSTEAD SUBDIVISION. THE CARLYLE II MODEL BUILT BY INLAND HOMES FEATURES 2 BEDROOMS PLUS SPACIOUS DEN, 2 BATHROOM AND 2 CAR GARAGE. BUILT ON OVERSIZED LOT GIVING YOU A LARGER REAR YARD, THE SPLIT BEDROOM FLOORPLAN OFFERS LIVING AND DINING ROOM COMBINATION, LARGE DINETTE AREA AND INSIDE LAUNDRY CLOSET. 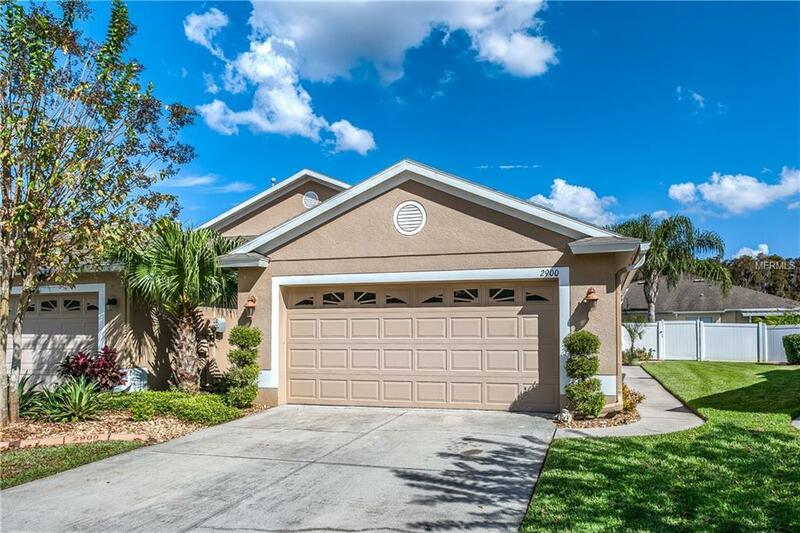 NEWER STAINLESS STEEL APPLIANCES, NEWER HVAC SYSTEM AND LIGHT COLOR DECOR MAKE THIS VILLA MOVE-IN CONDITION. YOU WILL ENJOY THE PRIVATE REAR YARD WITH PROFESSIONALLY LANDSCAPED CURBING, FULLY FENCED WITH VINYL FENCING AND LUSH GREEN GRASS. THE MASTER SUITE FEATURES BAY WINDOW SEATING, WALK-IN CLOSET, GARDEN TUB AND SEPARATE SHOWER. THE KITCHEN HAS OAK WOOD CABINETS, GAS RANGE, LOADS OF COUNTER SPACE AND THE CLOSET FOR THE WASHER AND DRYER WHICH REMAINS WITH THE HOME ALSO. THE GATED TANGLEWYLDE COMMUNITY IS MAINTENANCE FREE WITH HOA RESPONSIBLE FOR THE ROOF, EXTERIOR WALL PAINTING AND LAWNCARE - ALL FOR $180 STARTING 2019. THIS LOVELY COMMUNITY IS WELL MAINTAINED AND HAS NEVER HAD ASSESSMENTS AND IS BUDGETED FOR NEW ROOFS AND EXTERIOR PAINTING WITHIN THE NEXT COUPLE OF YEARS. THE OAKSTEAD COMMUNITY HAS 2 POOLS (ADULT AND KIDDIE), TENNIS COURTS, CLUBHOUSE, FITNESS CENTER, PLAYGROUND, PARK AREA, VOLLEYBALL AND BASKETBALL COURTS. ALL SCHOOLS ARE WITHIN 5 MINUTES AWAY. PERFECT LOCATION WITH RESTAURANTS, SHOPPING AND SUNCOAST EXPRESSWAY CLOSE. Additional Lease Restrictions Must Have 2 Years Ownership Before Lease Can Be In Effect. See Hoa For Other Questions. Listing provided courtesy of Kennard Realty Group, Inc.